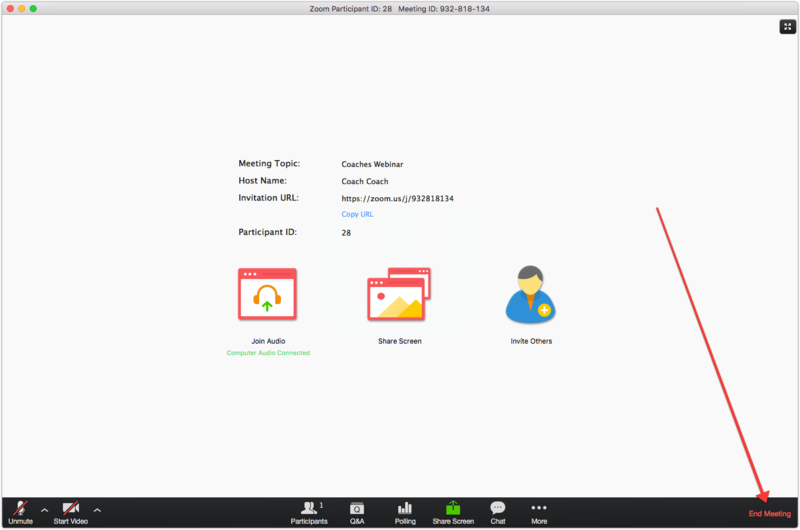 We use Zoom.us to run and record all webinars and coaching calls. 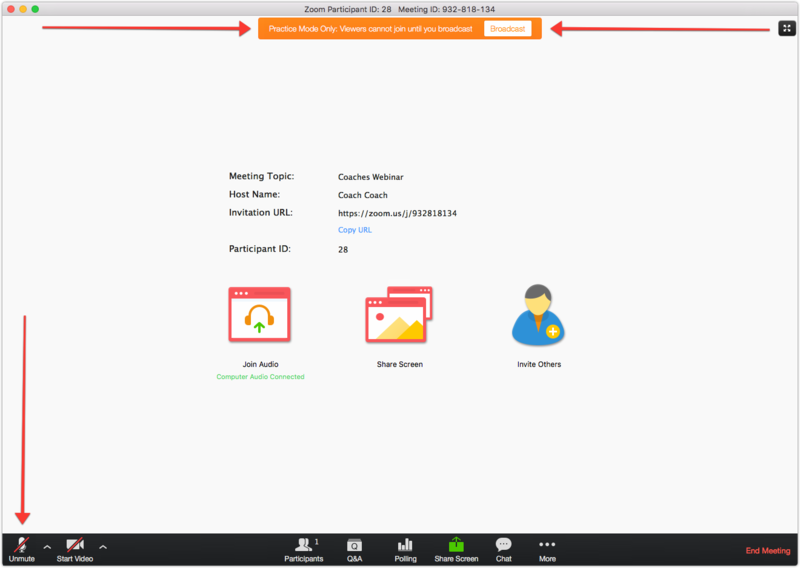 This is the process for presenting a webinar or coaching call with Zoom. 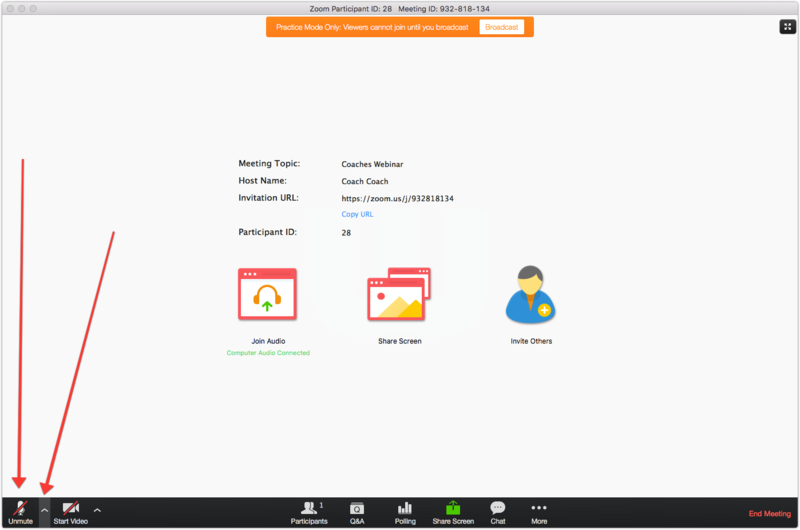 You should have the login details on file or in the Coaches vault. Post a message in the Private Facebook group letting members know that the call is about to start. Members from any country are welcome to join the call if they are around at the time and have the link. The post can be written however you like. Include an image (a picture of the screen, a selfie of you about to start etc) to grab their attention. 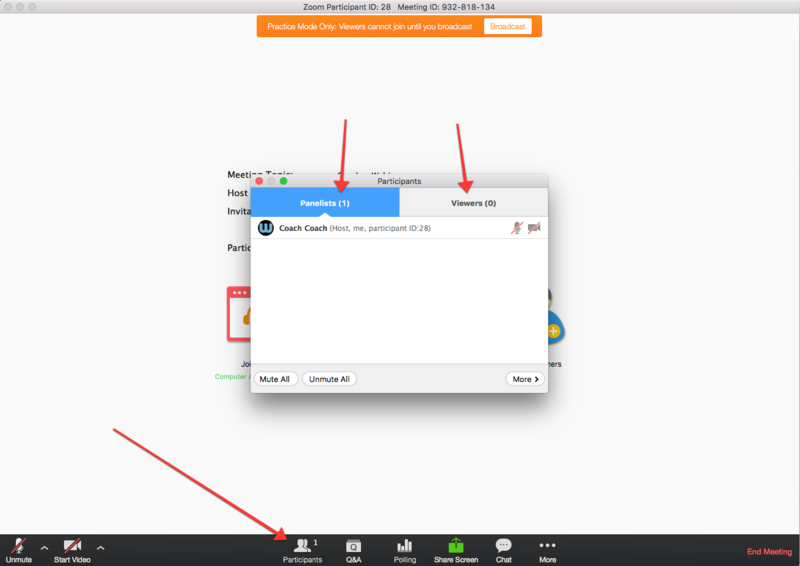 Make sure you have the Zoom link and Webinar ID from the Asana task and include them in the post. 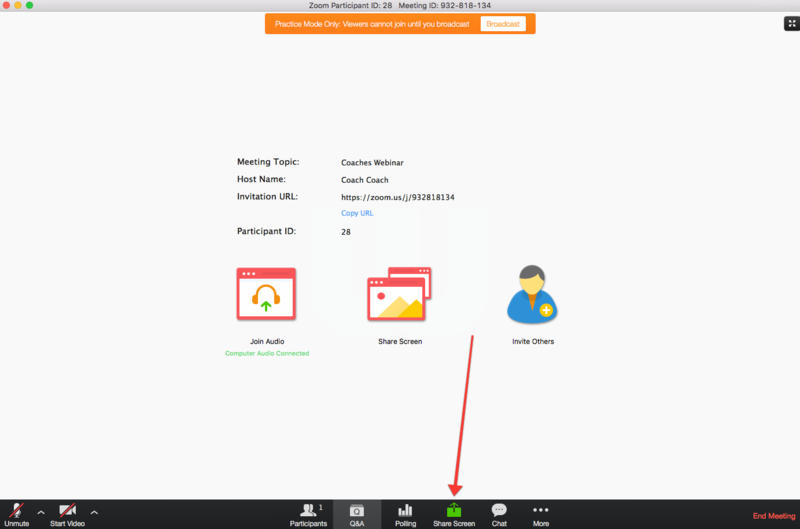 If you wish, you can update the profile to your name for your coaching call. Enter your name and click the Save Changes button. From the left-hand menu choose My Webinars and then Start Webinar for the correct webinar in the list. Your webinar will have been set up in Practice Mode, so you won't be broadcasting until you hit the "Broadcast" button. If you are hosting a guest presenter on your call, this is a good opportunity to practice with the guest and show them what they need to know (eg: how to share their screen). If you are not in practice mode, make sure you have the microphone muted and aren't sharing any screens until you are ready to start. Make sure your microphone is muted if you are not in practice mode. 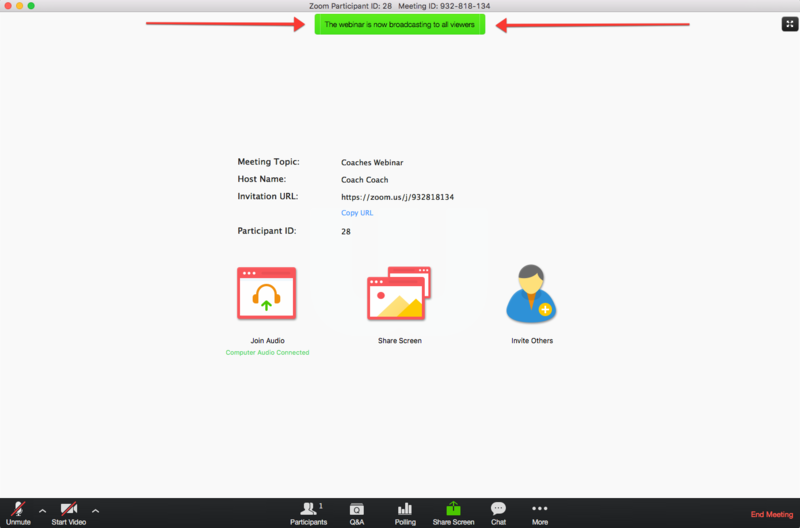 From the toolbar, click on the Participants button to open the participants screen. From here you will see the Panelists in one section and the Participants / Viewers in another. If your guest presenter is in the Participants / Viewers section, move them over to the Panelists by clicking on the button options. You and the guest should now be in the Participants section. Hovering over a panellists or viewers name will reveal more options. 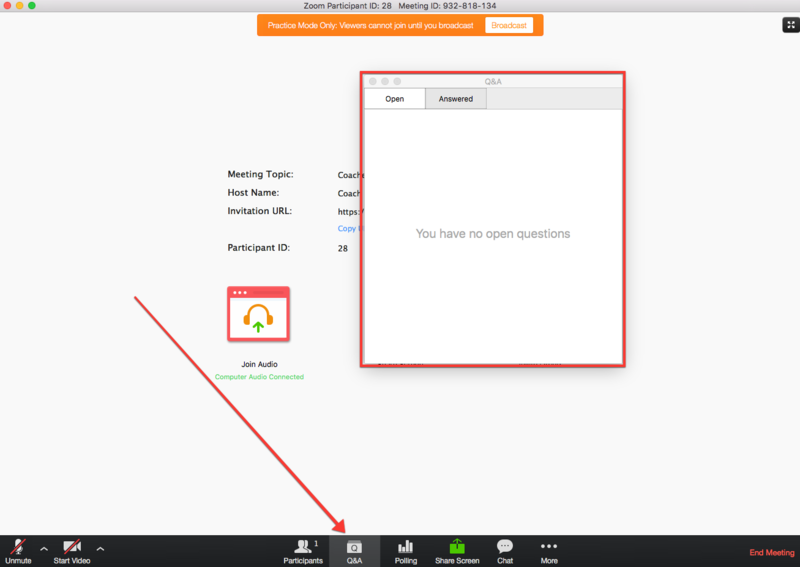 From the toolbar again, click the Q&A button so you are ready to view and answer questions from participants later. From the toolbar again, choose Chat to open the chat panel so you can verbally welcome people as they login and say hi. If you cannot see the Chat option it may be in the More submenu. You can ignore this later (it gets distracting) - just let the participants know that you'll only be responding to the Q&A section. Open your Keynote file. Press PLAY on your presentation to bring up the full screen. Have the full slides on one monitor (the one you will be choosing to "Share Screen" with in a minute) and the presenter notes on the other monitor. 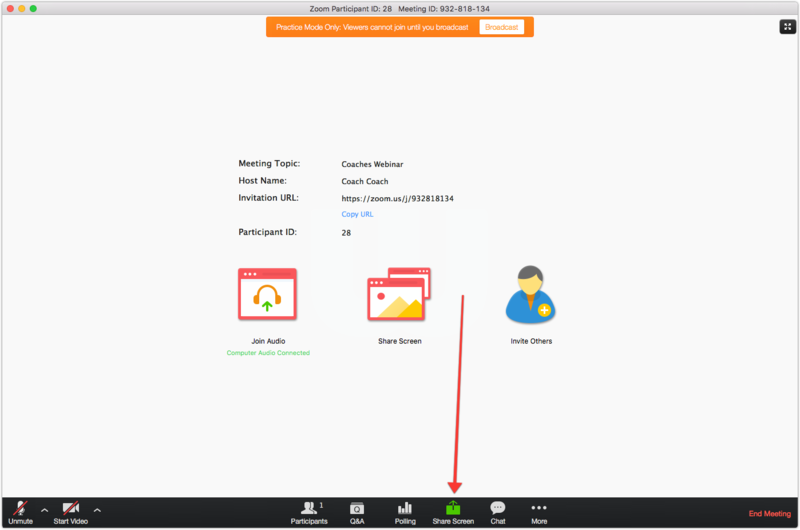 On the Zoom toolbar again, click on Share Screen and choose the desktop with your main presentation on it as the monitor to share. In my case, it's Desktop 2. 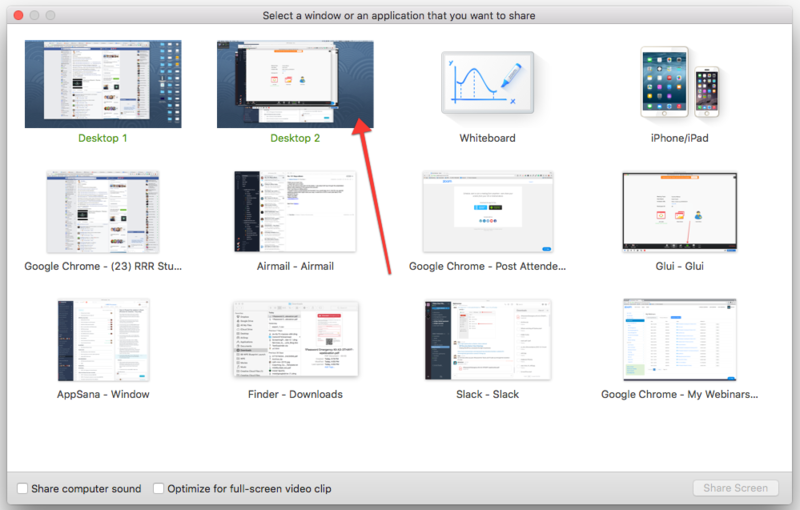 If you only have one monitor, you can choose the Keynote/PowerPoint application to share. Be aware if you do this you will not be able to easily switch to sharing your browser or other apps. Choose the desktop or app you wish to share. Have a practice on your own or with the guest presenter. If you have a guest, practice getting them to share their screen and un-mute their mic and then switching back to you. For you to take over again, just choose Share Screen again from the toolbar. 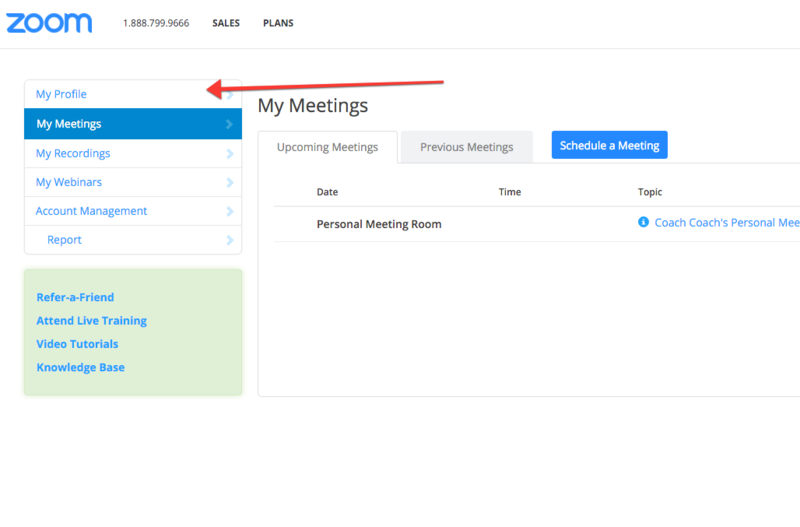 To make the guest the host of the call, hover over their name in the Participants box and choose More > Make Host. You might also find this help article from Zoom handy. Have your first slide ready to go on the correct screen. Make sure your audio settings are correct and then unmute your microphone from the zoom toolbar. Click on Share Screen if you are not already sharing your screen. 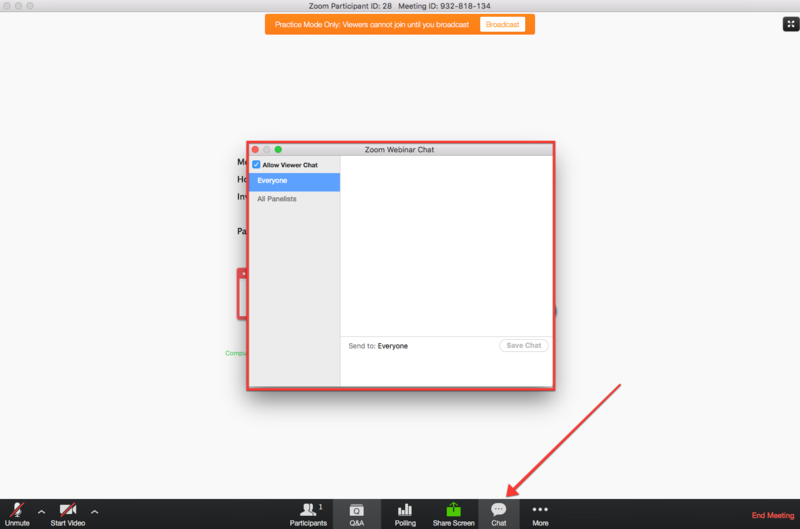 When you are ready to begin, click on the orange Broadcast button and Zoom will tell you that the broadcast has begun. Keep an eye on your Q&A panel for questions when it's question time. You can read the questions out yourself or invite participants on the call by asking them to raise their hand in the Zoom control panel. Go to the Participant panel, click on Viewers and identify anyone with their hand up. Click on hand and choose Make a Panelist. 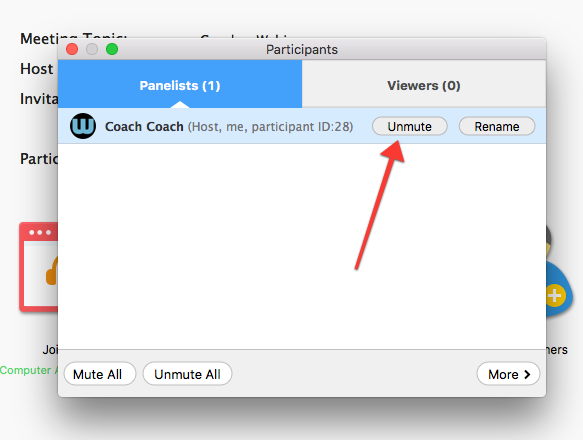 Switch your view over to the Panelist section then hover over their name when they appear and choose > Unmute to have a conversation with the participant. Once you have finished the conversation, hover over their name and choose Make a Viewer to return the participant back to viewer. 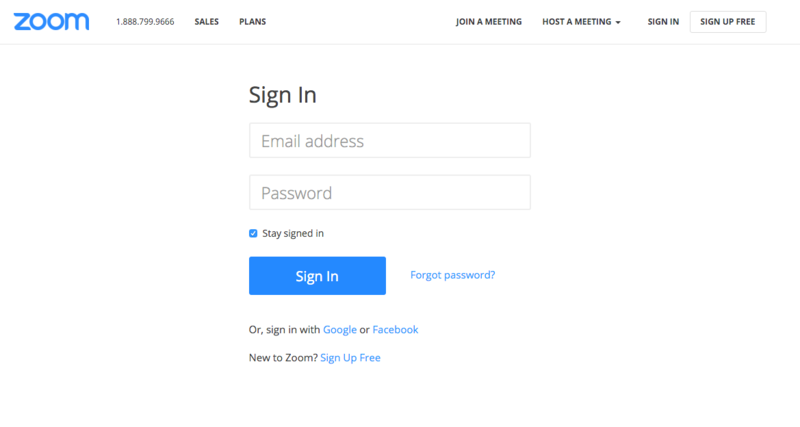 To end the webinar, choose End Meeting from the toolbar. This option may be hidden under the More menu. 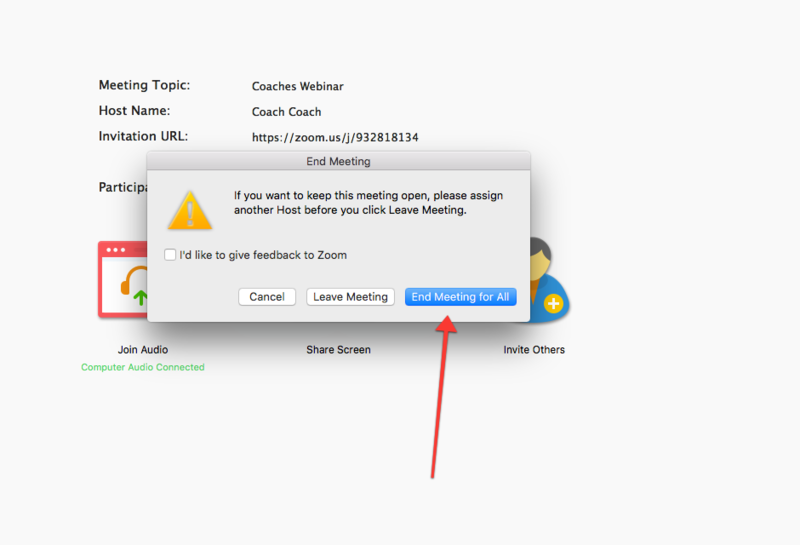 Then choose End Meeting for All from the popup box. 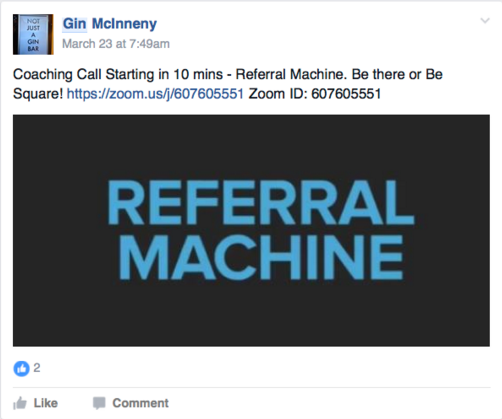 You will know this process is complete when your webinar has been successful recorded!